Still remember how Xiaomi managed to sell off its first batch of Xiaomi Redmi in Singapore within 8 minutes? Well, the smartphone manufacturer from China has managed to do it once again…and this time, the company managed to do it even faster. How fast? 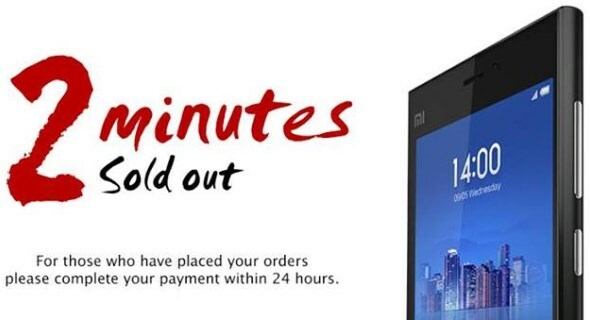 Believe it or not, Xiaomi managed to completely sold off its first batch of Xiaomi Mi 3 smartphone in Singapore within just two minutes. The device is the second Xiaomi product to be officially released into Singapore’s market after Xiaomi Redmi few weeks ago. But just like before, the company didn’t reveal the amount of Xiaomi Mi 3 that it managed to sell within that time frame. Naturally, this leads to plenty of speculations but then again, Xiaomi has achieved similar level of reception in China before for Xiami Mi 3. Now, when will be Malaysia’s turn, dear Xiaomi?